BATON ROUGE, La. – McNeese State scored two runs on wild pitches and received a strong six-inning performance from right-hander Brett Payne to defeat No. 12 LSU, 2-0, Tuesday night in Alex Box Stadium, Skip Bertman Field. 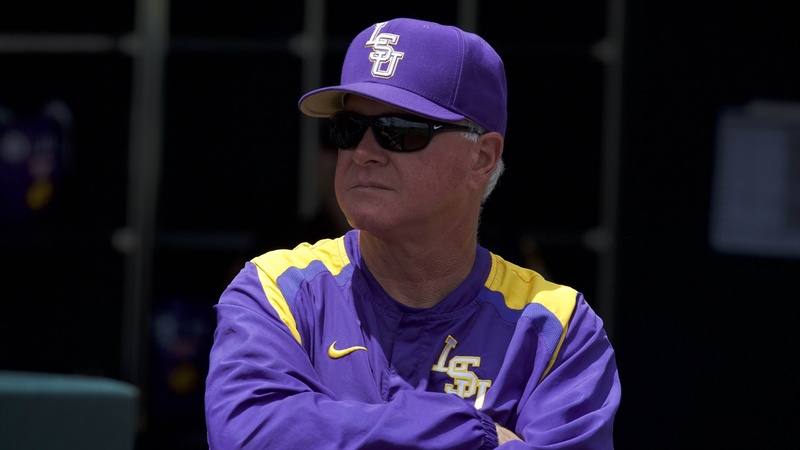 “It seems like we have one of these games every year, it’s just hard to explain,” said LSU coach Paul Mainieri. “I knew coming off an emotional week at Georgia and looking forward to a series at Mississippi State, it would take an awful lot of leadership to have the players ready to play, and we just didn’t get them inspired and motivated tonight. Sophomore right-hander Ma’Khail Hilliard (0-1) pitched 2.2 innings in the loss, allowing one run, one hit and two walks. He also recorded two strikeouts. Payne (1-0) earned the win for McNeese, working six innings and allowing two hits and three walks. He finished with five strikeouts. McNeese would bring another run across to score on a wild pitch in the top of the eighth. Left fielder Payton Harden singled to third, stole second and reached third on a ground out, and scored on a wild pitch by reliever Will Ripoll. In the bottom of the eighth, LSU second baseman Brandt Broussard singled through the center to start the inning, and then moved to third on a wild pitch. Shortstop Josh Smith followed with a walk, but both runners were left stranded. LSU showed some signs of life in the bottom of the ninth with a walk by leftfielder Giovanni DiGiacomo and a two-out single from first baseman Cade Beloso. However, a fly out by Broussard ended the game. The Tigers used four pitchers out of the bullpen. Senior Clay Moffitt tossed 2.1 innings and allowed one hit. He notched two strikeouts in the effort. Junior Aaron George worked two innings and gave up one hit and one walk with two strikeouts. Ripoll pitched one inning and allowed one hit, one run and a walk to go with one strikeout. Matthew Beck pitched the ninth inning and allowed two walks, but picked up two strikeouts.